StoryBox is a read aloud magazine for young children of this aged between 3 to 6 years old. StoryBox is a magazine that has been specially designed for children in the age of three to six years. It was first launched few years back and it is a monthly magazine. 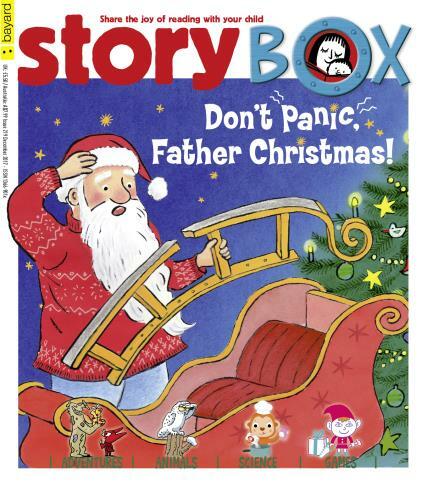 StoryBox is a read aloud magazine for young children of this age. Parents can introduce reading aloud to their children with the help of this magazine. This magazine is very famous among the parents, as they prefer to use it for their children every month, to teach them how to read stories and poetries and phrases for themselves. The editors of this magazine work really hard to make this a success and try to make it more and more interesting by each issue. They make reading an enjoyable and interesting activity for the children and convenient for the parents to teach them. StoryBox has received a lot of success all over the world and each day, more and more parents are looking forward to it. StoryBox is the magazine that teaches English to young children, internationally. Rhymes, Stories and other reading activities are provided in this magazine. Various new characters are provided in the magazine, so that the children do not lose interest with the same characters for a long time. It consists of almost twenty five pages in each issue. The presentation of the magazine is also worth mentioning. Glossy pages with colorful illustrations are provided. The vibrant colors make the magazine more attractive to the young children. StoryBox magazine is brough to you by the same publishers as DiscoveryBox and AdventureBox magazines. A good magazine. Age group difficult to say as bit too hard for leaving early readers to try on their own. Content varied and presented in interesting way. Stories good. Excellent magazine. Full length stories are a big plus. Interesting and educational. Very nice magazine for children & parents to read together. A lovely magazine that holds the interest of my 5 year old very well. We enjoy reading the stories together and find the factual sections very informative. She enjoys looking at it by herself and colouring in the pictures. Other members of the family also enjoy reading the magazine. Our 7 year old particularly enjoys Polo. This magazine is super for children learning to read. My 2 boys have been waiting impatiently for the next magazine to arrive by post ever since we subscribed and I enjoy reading it with them. The whole family thinks it's a great magazine. We previously have tried other magazines for kids but this is the best yet, it is something the whole family can get involved with. We get a great story to read together, the 2 comic strips, the differently themed activities every month, and it's educational too in a fun way. There isn’t one part of it our daughter doesn't enjoy and it's advert free and feels great quality that will last forever which keeps me paying out of my wallet for it.